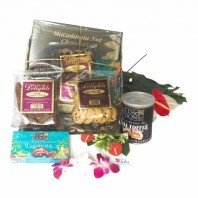 Categories: Hawaiian Gift Baskets, Kona Coffee Gifts. 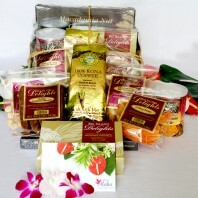 Special 100% Kona coffee gift bag. 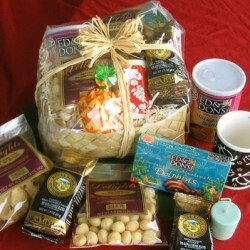 Coffee gift baskets are perfect for the discriminating Kona coffee lover! This gift bag is filled with hand made Kona coffee cookies, Hawaiian macadamia nut biscotti, and fresh 100% Kona coffee in a 7 ounce bag. 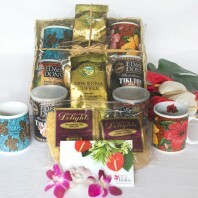 We add a beautiful Hawaiian print coffee mug and fragrant Kona coffee candle. Our candle is hand made with natural soy. Tiki toffee is a rare local treat made from mac nuts. 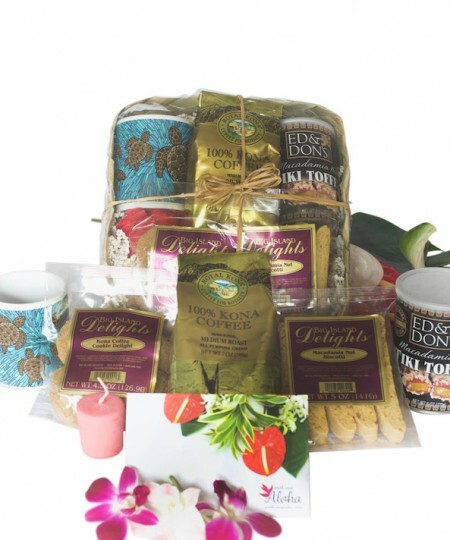 We’ll pack your Kona coffee gift in a tropical print gift bag or wrapped in a lauhala basket tied with craft raffia. Makes a unique holiday basket for any coffee drinker. This is a rich and natural gift whether on the mainland or here in Hawaii. 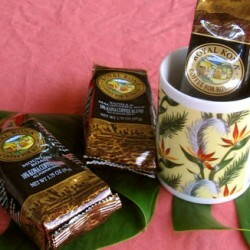 100% Kona coffee is a state treasure in Hawaii. Grown on the west side of the Big Island Kona coffee is enriched with volcanic soil and tropical air. 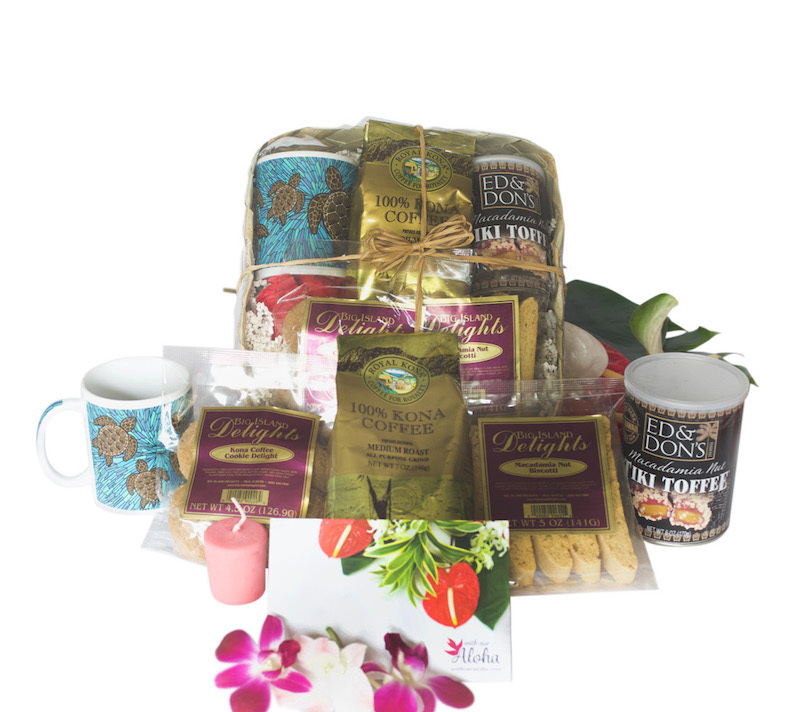 The coffee in this gift basket does not contain any foreign blends. Just 100% Kona coffee. Our biscotti are long, crisp and lightly sweetened. They are perfect for enjoying alongside your coffee or for dunking right in. Baked twice for extra crispiness. Kona coffee cookies are crisp snaps with just enough coffee flavor. Each package contains nine cookies. 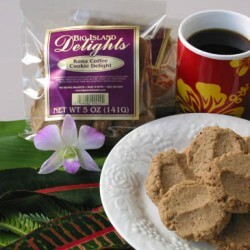 These Kona coffee cookies are infused with local Hawaiian coffee and baked on the Big Island. The soy candles are slso hand made locally. This is a soy candle infused with the aroma of fresh coffee. 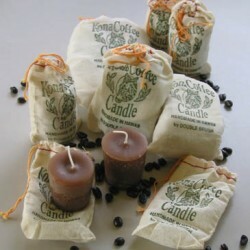 It comes in a small muslin bag inspired by the large bags used to pack coffee beans on Hawaiian coffee plantations. Tiki toffee is unique to Hawaii. It’s made of mac nuts and chocolates in a wrapped candy sweetness.This rich candy is not usually found on the mainland. And how better to enjoy fresh coffee than with a Hawaiian print coffee mug. 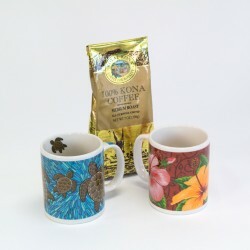 They will be reminded of your Kona coffee gift every time they have a cup. 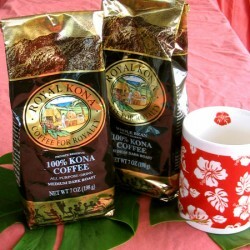 This Kona coffee gift is available for free delivery to Waikiki hotels.